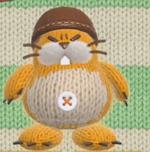 Big Montgomery appears as the first mid-boss in Yoshi's Woolly World and Poochy & Yoshi's Woolly World. During his boss fight, he hides in the background. After a few seconds, he jumps out of the background and performs a Ground Pound. When Montgomery does this attack, Yoshi must avoid it to not take damage. Big Montgomery later reappears as the mid-boss of World 3 and World 5. Big Montgomery about to confront Yoshi for the first time. The stage for this battle is a large woven sheet of brown wool that forms the platform Yoshi can walk on, as well as a background wall that Big Montgomery comes out of. His first attack is to dive into the floor and burrow up into the wall, visible as a large bulge in the fabric. He will burst out of the wall and try to land on Yoshi. If he misses, he will attempt to chase Yoshi across the floor area of the stage. Yoshi must jump on his head while he is exposed. Doing so will cause Big Montgomery to reveal his weak spot: a big X on his bottom. Yoshi must Ground Pound on this X to deal damage. After getting hit once, Big Montgomery throws a blue spiked ball at Yoshi that rolls along the floor, so Yoshi must jump to dodge it. Once the spiked ball has been thrown, he will do his first attack again. After getting hit again, he instead throws a red spiked ball at Yoshi, except it bounces along the ground instead of rolling. After three ground pounds on his X, the battle ends. The second battle against Big Montgomery takes place in a very similar arena to the first. This time, the arena is a large sheet of woven pink wool. Big Montgomery now wears a helmet, so jumping over his head doesn't have any effect. Yoshi can bounce on it to gain some extra height. Big Montgomery's first attack is similar to his one from the previous battle, except that this time, he emerges with a red spiked ball on his hands and throws it at Yoshi. He also stands on top of three Monty Moles. Yoshi can swallow the Monty Moles to make yarn balls. Yoshi must shoot one at Big Montgomery to make his Monty Mole tower collapse, revealing his weak spot again. After getting hit once, Big Montgomery will dive into the wool and burrow up the wall. He again bursts out trying to land on Yoshi. This time, however, shockwaves that hurt Yoshi will ripple across the wool when he lands. Yoshi must jump to avoid them. Big Montgomery repeats his first attack, except he throws three blue spiked balls instead. After getting hit again, Big Montgomery will again burrow up the wall, but this time he emerges in the center shortly after two Monty Moles burst out from either side of him. Yoshi must dodge the Monty Moles and the shockwaves after Big Montgomery lands. He then repeats his first attack, only with three red spiked balls instead. Big Montgomery's third and final battle. This battle with Big Montgomery takes place in a very different stage to the previous two. The floor is made of ice blocks. Yoshi will slide if he tries to walk or run. The background wall of wool is now at an angle, resembling a ski slope. Big Montgomery's first attack is to attack Yoshi from beneath the ice blocks. When he pushes up two ice blocks and he is visible, a ground pound on these ice blocks causes him to reveal his weak spot on his bottom. After getting hit once, Big Montgomery will burrow up to the top of the wool slope and order Monty Moles to roll down the hill. As they roll, they gather fiber and enlarge like snowballs. After all the Monty Moles have rolled off the arena, Big Montgomery will again try to attack Yoshi from beneath the ice blocks. After the second hit, Big Montgomery will again make his way to the top of the hill, this time ordering seven Monty Moles to roll down the hill; first a wave of four, then a wave of three. He will then roll down the hill himself forming a massive snowball for Yoshi to dodge. Instead of reappearing under the ice blocks as previously, he burrows halfway back up the hill, bursts out, and ground pounds the ice blocks himself. This will cause a massive shockwave on either side of him, which will smash Yoshi into the ceiling, causing damage if not avoided. He then chases Yoshi around the stage, and because he has his helmet on, Yoshi can only avoid him and wait. Also, more Monty Moles are rolling down the hill at Yoshi. Once Big Montgomery has crossed the screen two or three times, he will again try to attack Yoshi from under the ice blocks. Yoshi now must ground pound a third time to end the battle. Big Montgomery, wearing his helmet on the boss tent screen. All of Big Montgomery's battles appear in the Boss Tent, where he is fought the same way; however, he moves much faster than normal, making him harder to hit. French (NOA) Topulente la tapie "Topulente" is a pun of "Taupe" (mole) and the feminime form of "corpulent". "Tapie" means "hidden, concealed". This page was last edited on March 30, 2019, at 13:25.